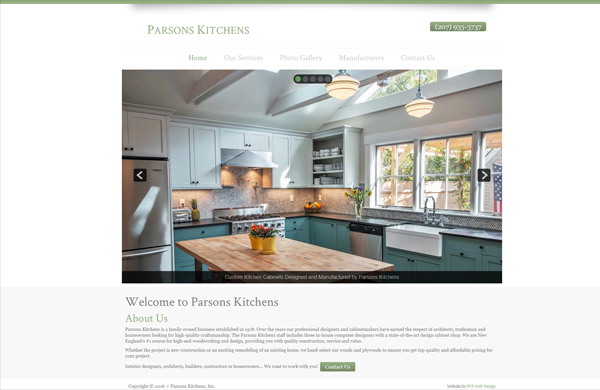 CMS-enabled Website Design by PCS Web Design for a high-quality manufacturer of custom cabinetry in Brownfield, ME. 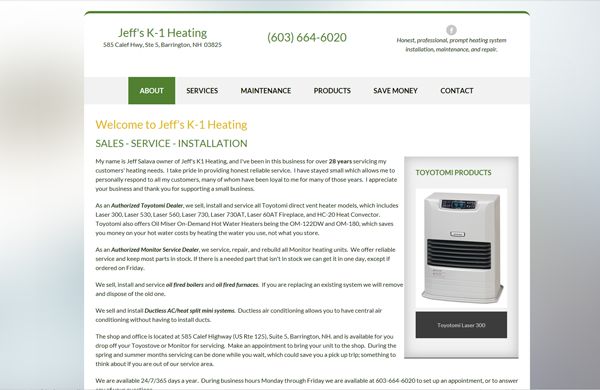 CMS-enabled Website Design by PCS Web Design for a heating systems installer in Barrington, NH. 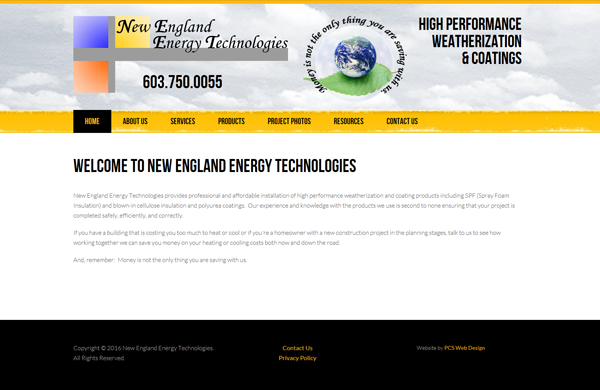 CMS-enabled Website Design by PCS Web Design for a spray foam insulation contractor in Dover, NH. 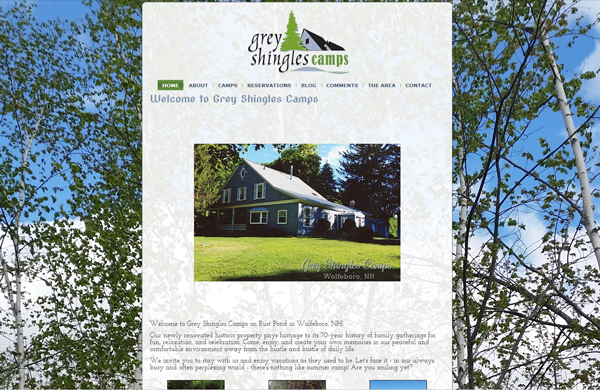 CMS-enabled Website Design with e-commerce capabilities by PCS Web Design for vacation camp rentals in Wolfeboro, NH. 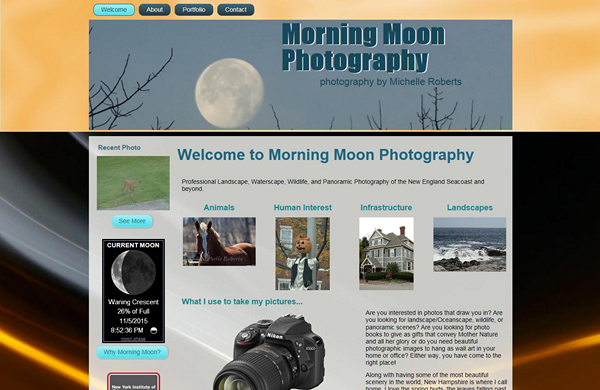 CMS-enabled Website Design by PCS Web Design for a professional photographer in Dover, NH. 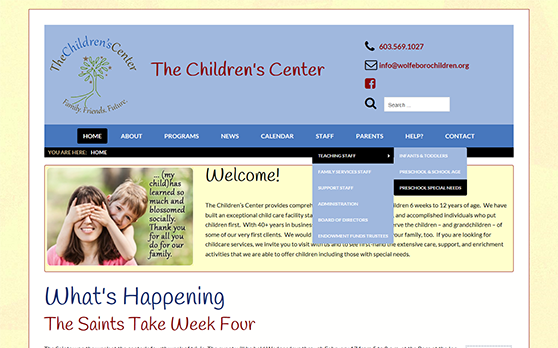 CMS-enabled Website Design by PCS Web Design for an exceptional childcare facility with a 40-year history. 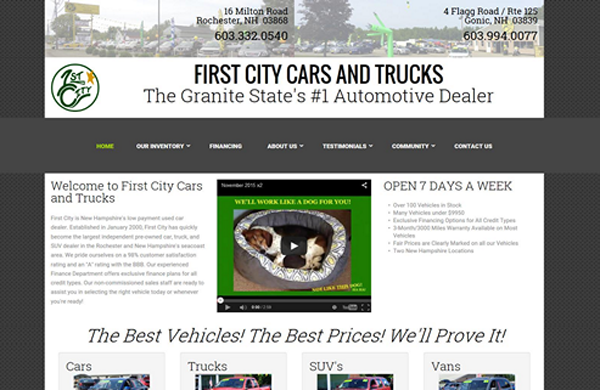 CMS-enabled Website Design by PCS Web Design for a used vehicle dealership with two locations. 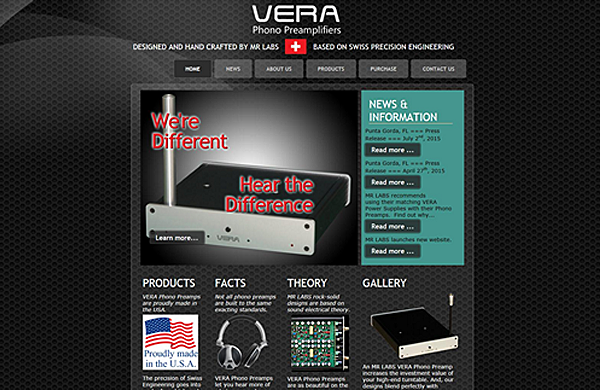 CMS-enabled Website Design by PCS Web Design for a manufacturer and distributor of high-end phono preamplifiers that targets the audiophile market. 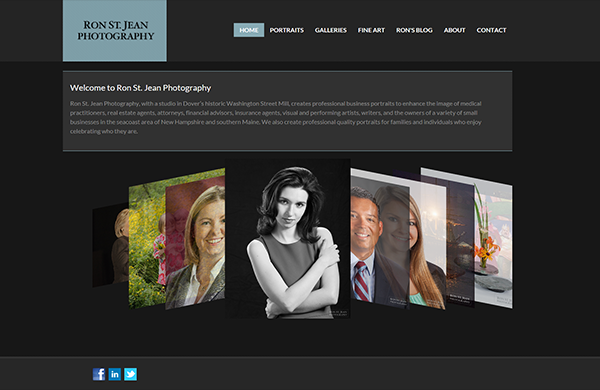 CMS-enabled Website Design by PCS Web Design for a professional photographer. 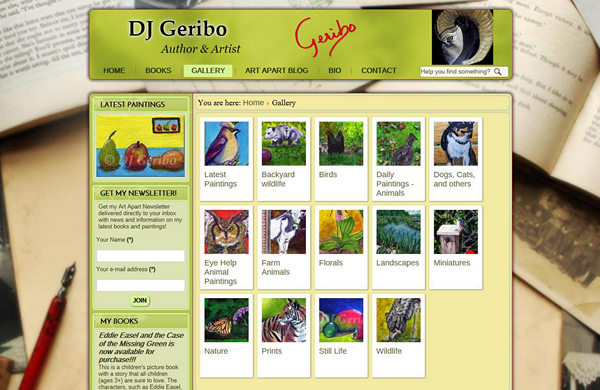 CMS-enabled Website Design with e-commerce capabilities by PCS Web Design for an author and fine artist. 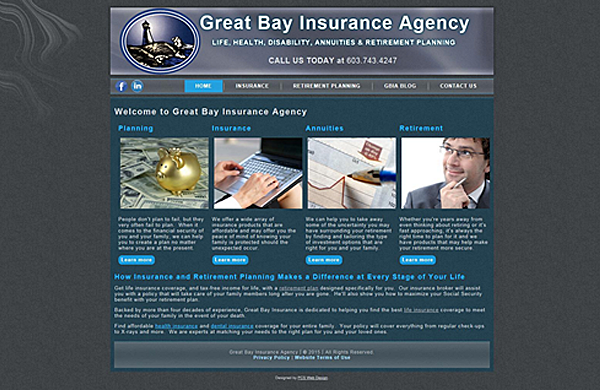 CMS-enabled Website Design by PCS Web Design for a multi-line insurance agency. 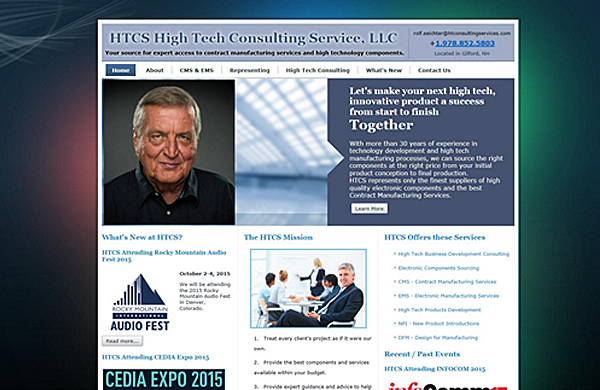 Basic Business Website Design by PCS Web Design for a company growth strategy advisory firm. 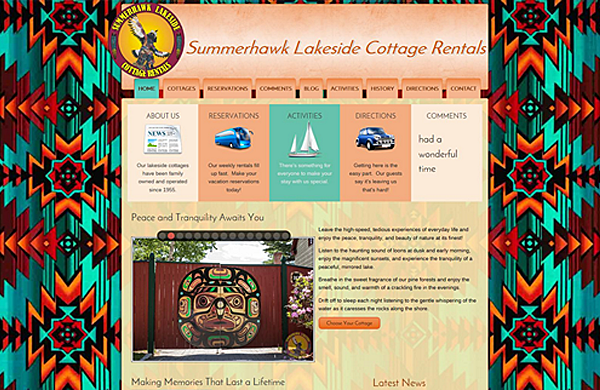 CMS-enabled Website Design by PCS Web Design for a waterfront cottage rental business located in the 'Oldest Summer Resort in America' - Wolfeboro, New Hampshire. 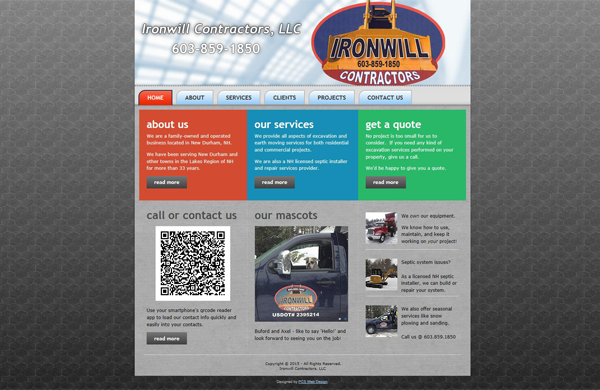 Basic Business Website Design by PCS Web Design for an excavation contractor and licensed septic designer / installer. CMS-enabled Website Design by PCS Web Design for a consulting firm that provides access to offshore contract manufacturing services and high technology components. 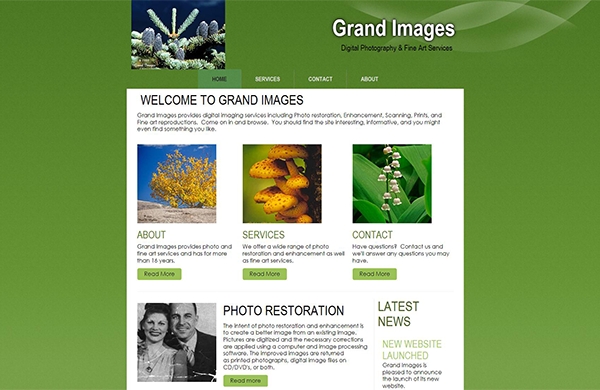 CMS-enabled Website Design by PCS Web Design for a digital imaging and photographic restoration services provider. 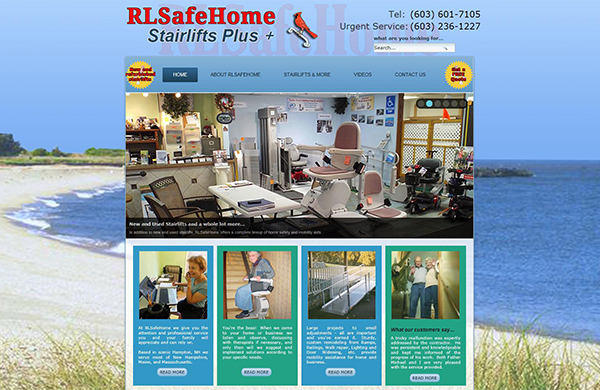 CMS-enabled Website Design by PCS Web Design for a mobility products, stairlift, and vertical platform lift dealer / installer. 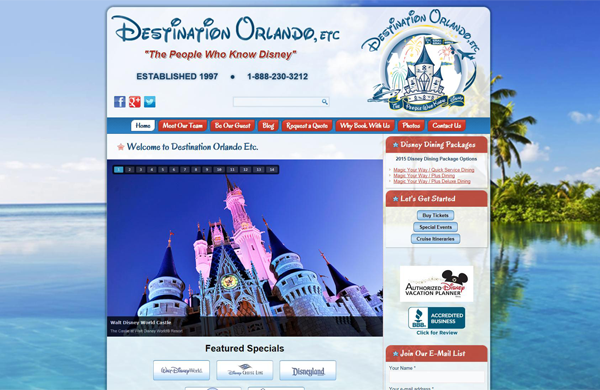 CMS-enabled Website Design with e-commerce capabilities by PCS Web Design for a growing 'Disney-Only' travel agency. 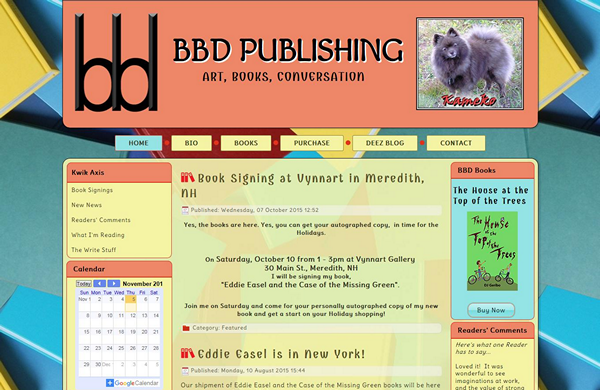 CMS-enabled Website Design with e-commerce capabilities for a privately held publishing company. 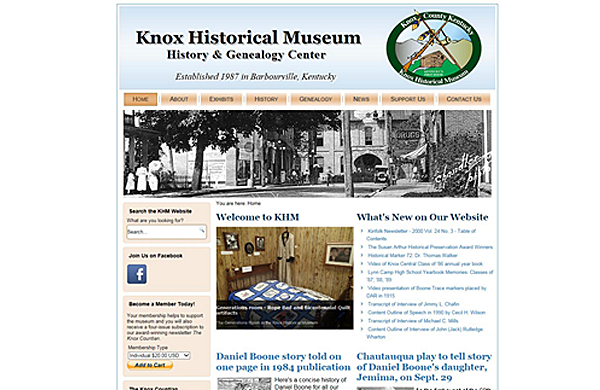 CMS-enabled Website Design with e-commerce capabilities for a non-profit historical museum located in Barbourville, Kentucky. 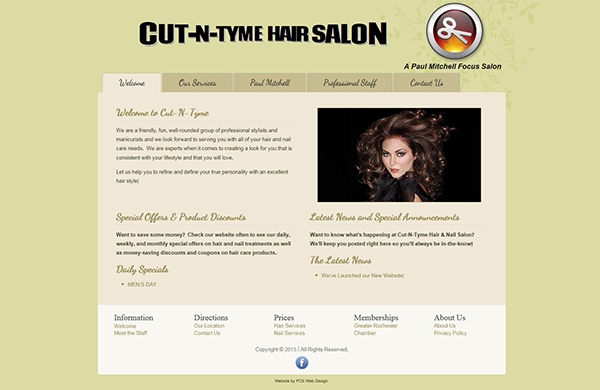 CMS-enabled Website Design by PCS Web Design for a busy hair salon located in Rochester, NH. 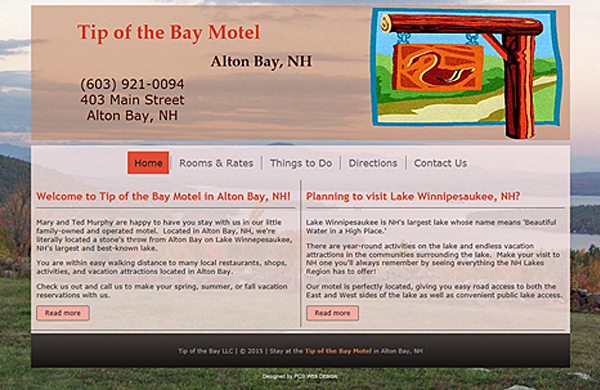 Basic Business Website Design by PCS Web Design for a very small independent motel located in Alton Bay, New Hamsphire. 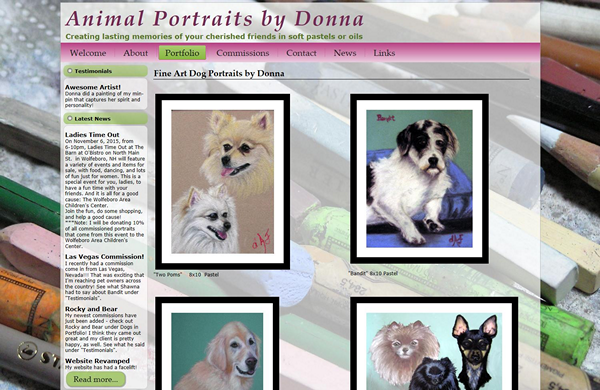 CMS-enabled Website Design by PCS Web Design for an animal portrait artist. 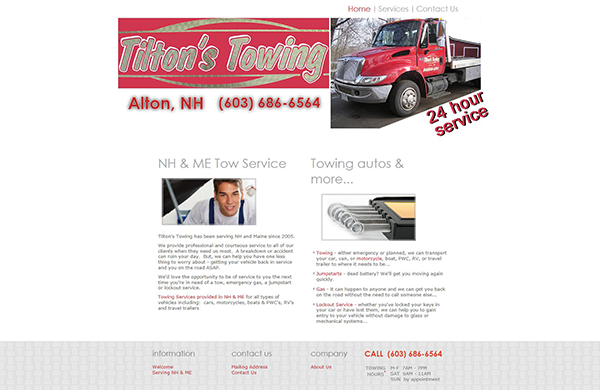 Basic Business Website Design by PCS Web Design for a local tow services provider. 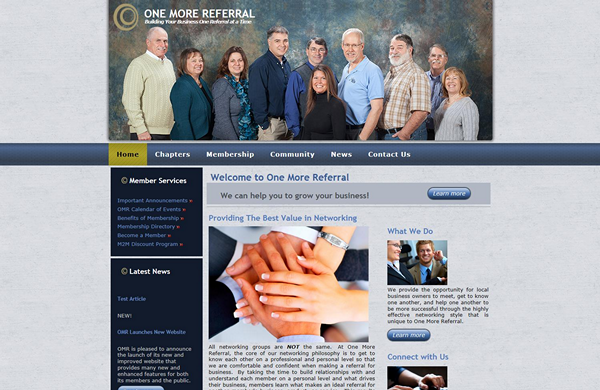 CMS-enabled Website Design with e-commerce capabilities for a multi-chapter networking group serving the Seacoast and Portsmouth areas of New Hampshire. 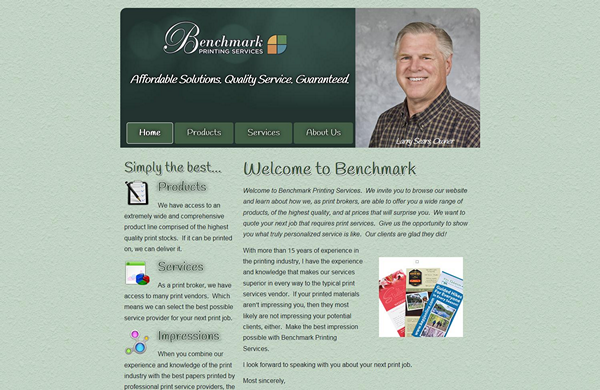 CMS-enabled Website Design by PCS Web Design for a printing services company. 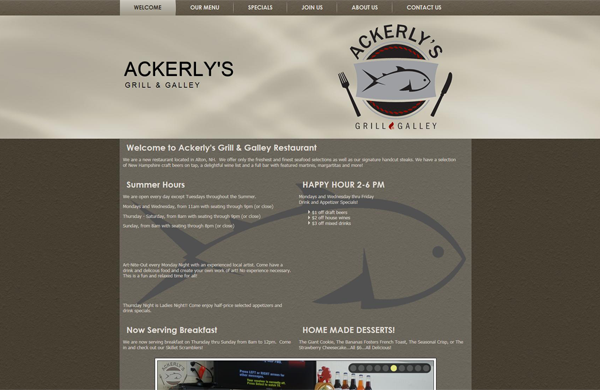 CMS-enabled Website Design by PCS Web Design for a very popular local restaurant in Alton, NH. 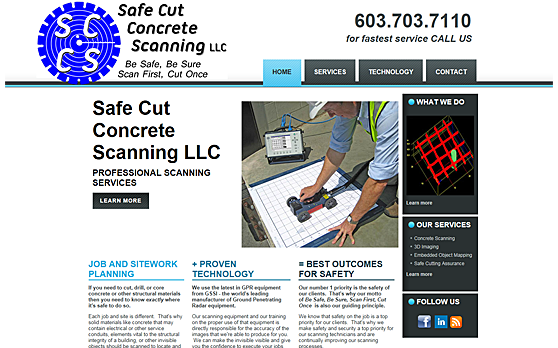 Basic Business Website Design by PCS Web Design for a 3D imaging company providing concrete scanning and embedded object mapping services to the commercial construction industry throughout northern New England. 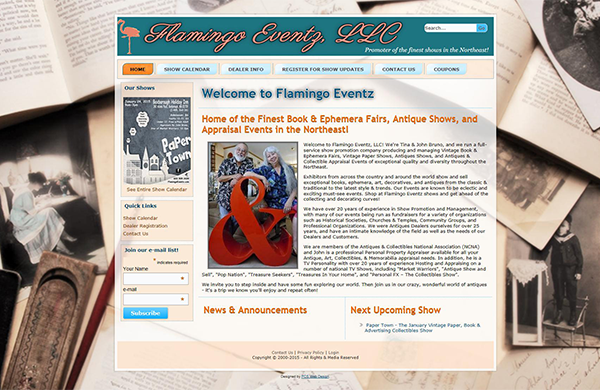 CMS-enabled Website Design by PCS Web Design for a show promoter of the Finest Book & Ephemera Fairs, Antique Shows, and Appraisal Events in the Northeast. 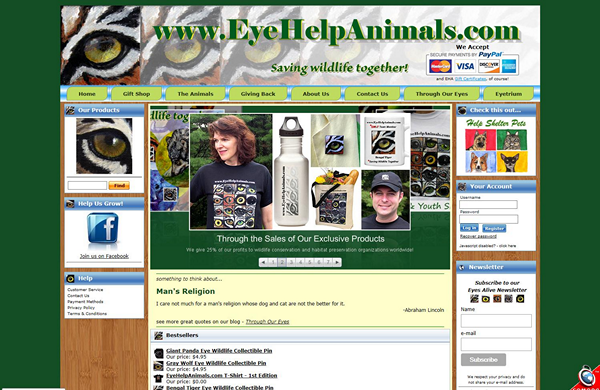 E-Commerce Website Design that's also CMS-enabled by PCS Web Design for an organization that supports wildlife conservation and habitat preservation throughout the world. 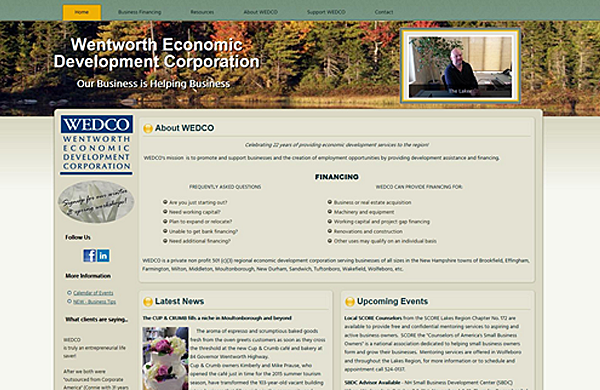 CMS-enabled Website Design with e-commerce capabilities by PCS Web Design for a non-profit economic development services corporation servicing communities located in Carroll County, New Hampshire. 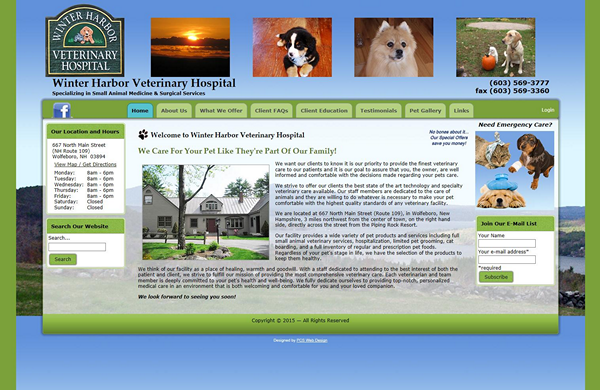 CMS-enabled Website Design by PCS Web Design for a veterinary hospital providing services to small animal clients. 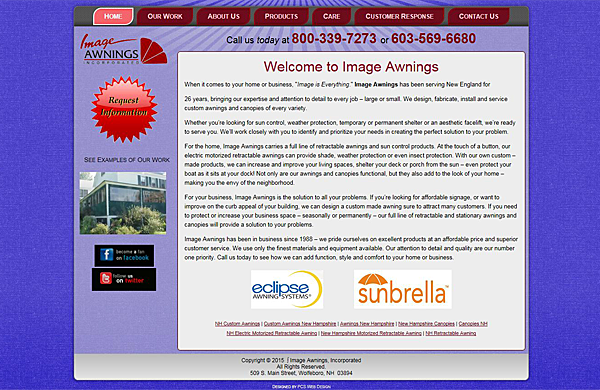 CMS-enabled Website Design by PCS Web Design for a custom manufacturer and installer of Residential and Commercial awning systems, boathouse and dock canopies, and motorized awnings. 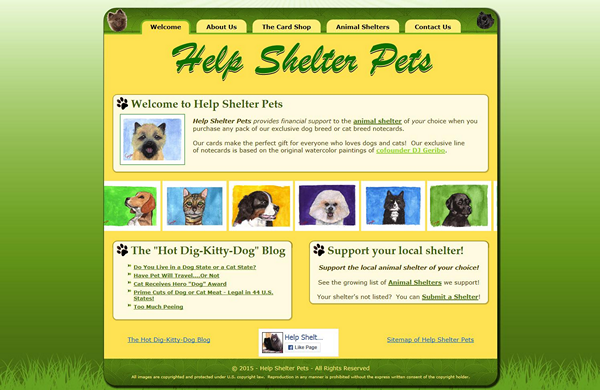 CMS-enabled Website Design with e-commerce capabilities for an organization that support animal shelters throughout the USA. 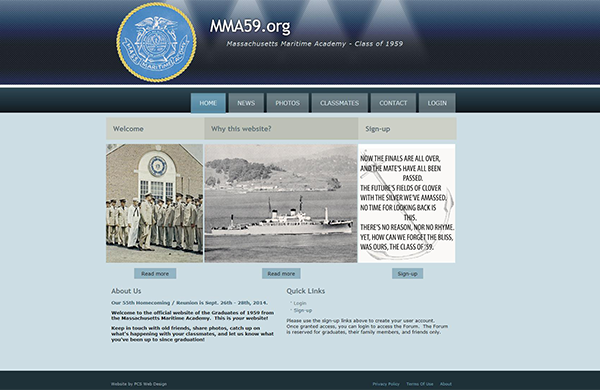 CMS-enable Website Design by PCS Web Design for Massachusetts Maritime Academy Class of 1959. 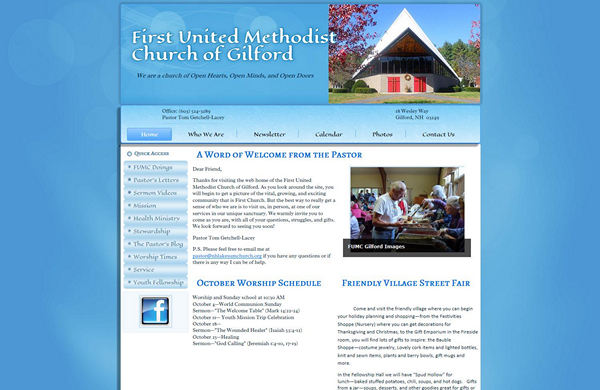 CMS-enabled Website Design by PCS Web Design for a United Methodist Church. 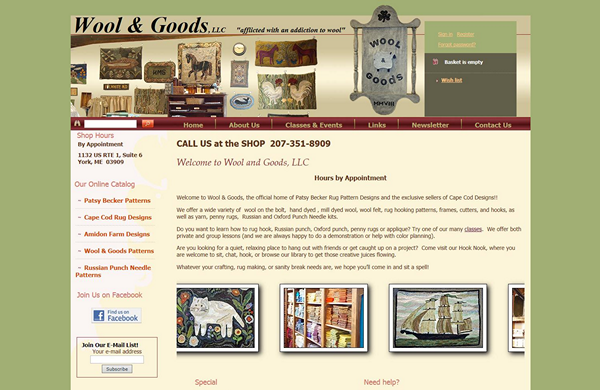 E-Commerce Website Design that's also CMS-enabled by PCS Web Design for a retailer of rug hooking patterns and materials as well as the exclusive distributor of hooked rug patterns by Patsy "B" (Becker). 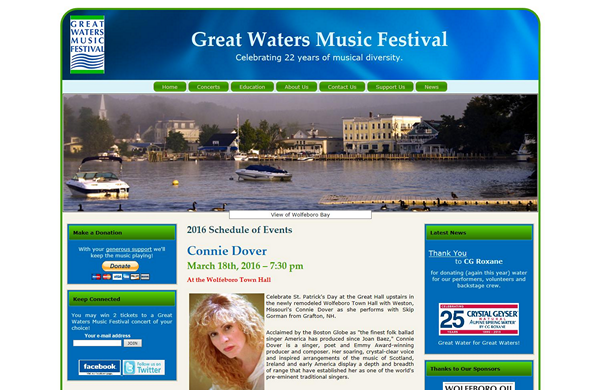 CMS-enabled Website Design by PCS Web Design for a local non-profit that's well-known for its summer concert series in Wolfeboro, NH. 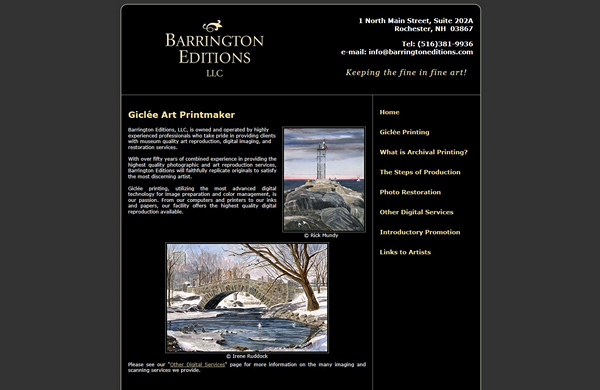 Basic Business Website Design by PCS Web Design for a fine art reproduction, photo restoration, and digital imaging services business. 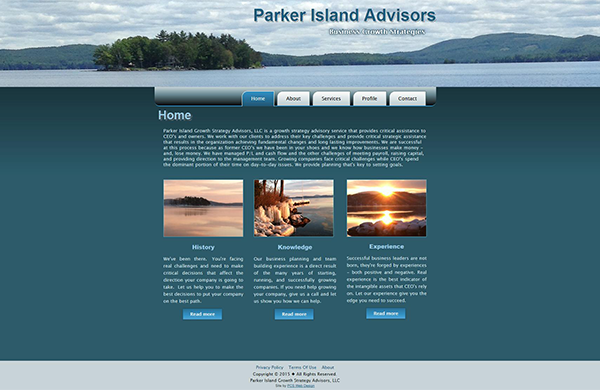 CMS-enabled Website Design by PCS Web Design for a business broker agency that's been serving buyers and sellers since 1976. 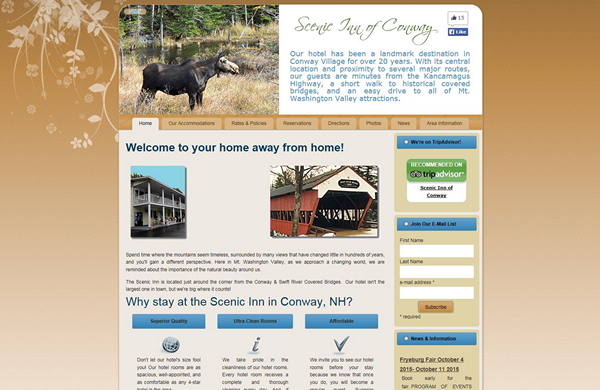 CMS-enabled Website Design by PCS Web Design for a hotel located in the tourist destination of North Conway, New Hampshire. 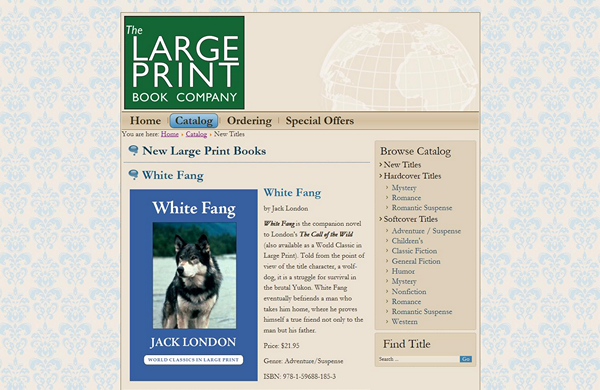 CMS-enabled Website Design by PCS Web Design for a publisher that produces classic literature in large-print format books. 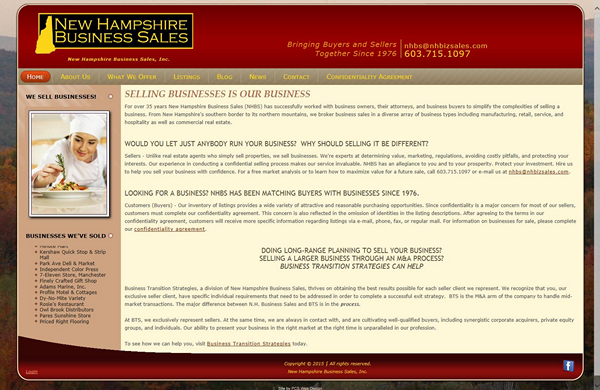 Basic Business Website Design by PCS Web Design for the largest privately managed charitable trust in New Hampshire. 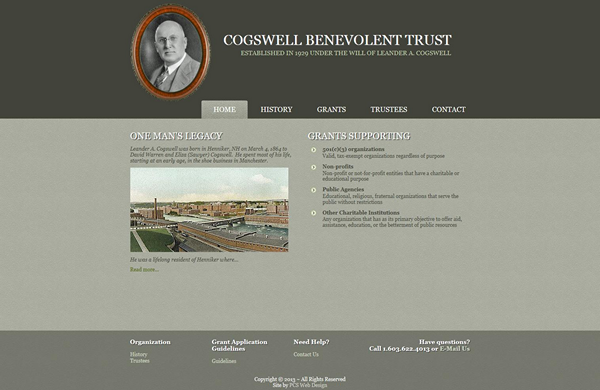 CMS-enabled Website Design by PCS Web Design for an outstanding non-profit organization that's brought musical performances to the Lakes Region of New Hampshire since 1936. 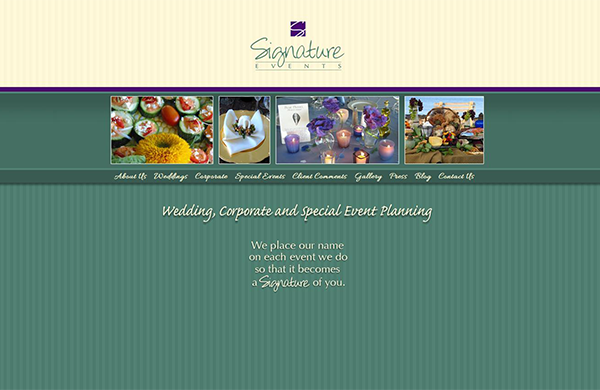 CMS-enabled Website Design by PCS Web Design for a wedding and corporate event planning professional. 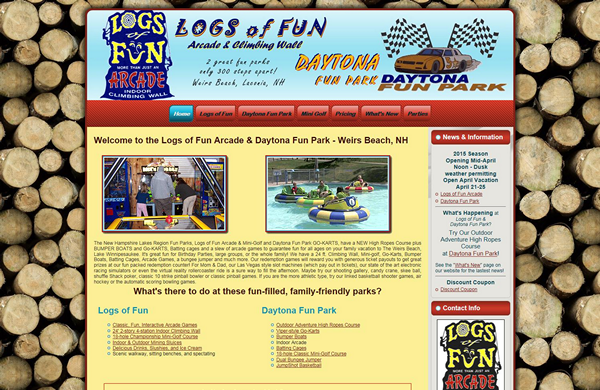 Basic Business Website Design by PCS Web Design for an arcade with indoor climbing wall and bumper boats and cart racetrack businesses. 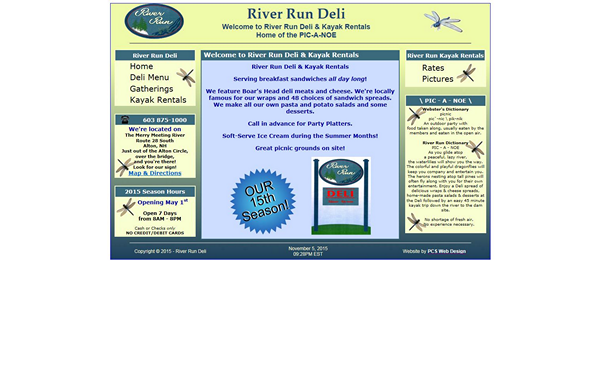 Basic Business Website Design by PCS Web Design for a local deli and kayak rental business. 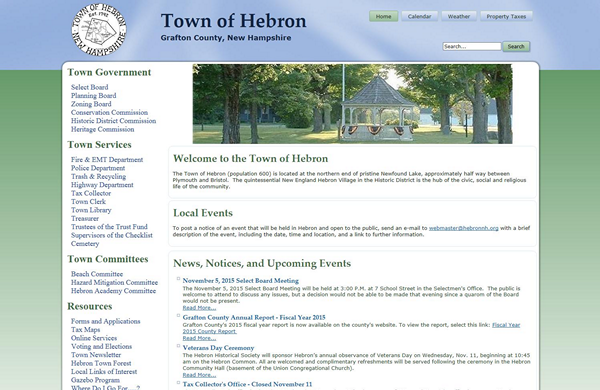 CMS-enabled Website Design by PCS Web Design for the Town of Hebron, New Hampshire. 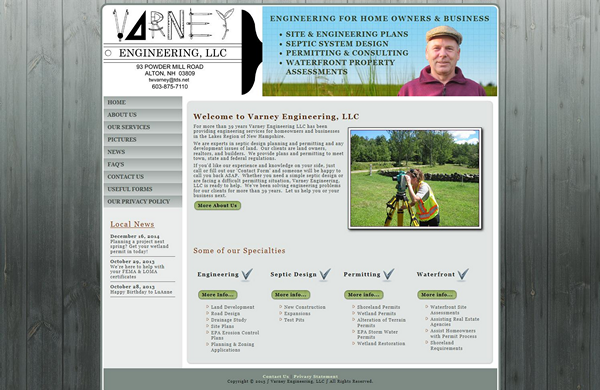 Basic Business Website Design by PCS Web Design for an engineering and septic system design firm. E-Commerce Website Design that's also CMS-enabled by PCS Web Design for a retailer of cigars and related products. 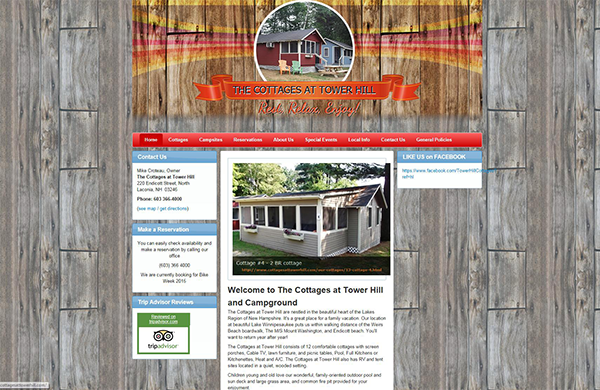 CMS-enabled Website Design by PCS Web Design for rental cabins and campground located in Laconia, NH. 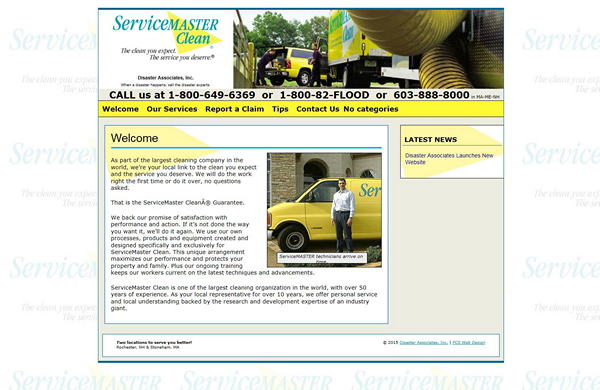 CMS-enabled Website Design by PCS Web Design for a ServiceMaster Clean franchise operator. 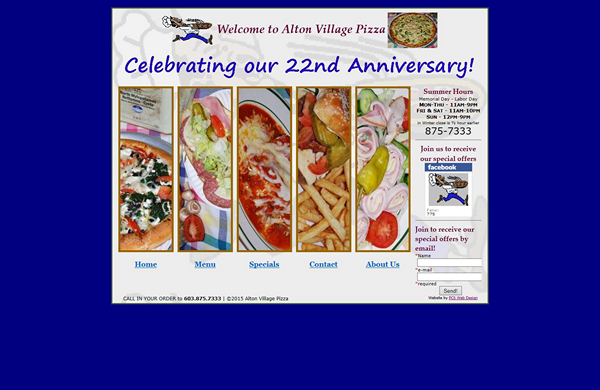 Basic Business Website Design by PCS Web Design for a family owned and operated pizza restaurant. 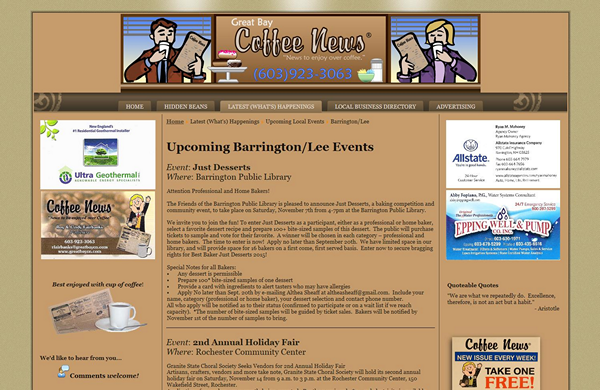 CMS-enabled Website Design by PCS Web Design for a rapidly expanding Coffee News franchise owner serving multiple communities in the Seacoast region of New Hampshire. 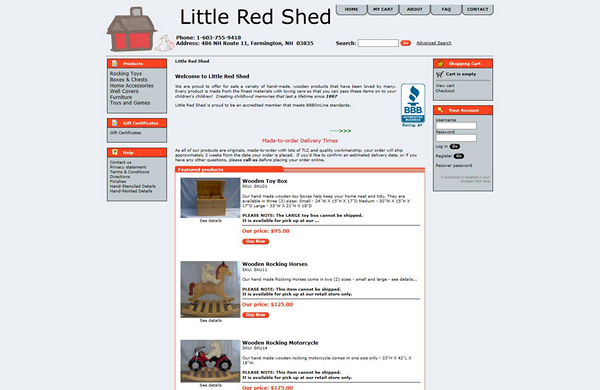 E-Commerce Website Design that's also CMS-enabled by PCS Web Design for a manufacturer of old-fashioned and handmade wooden toys, chests, and other items. PCS Web Design offers complete website designs ranging from basic business websites to database-driven, CMS-enabled, and full e-commerce enabled websites as well as everything in between. Every website we design is now mobile-friendly which is critically important for any website today. We understand SEO and build websites that can be found! See our Portfolio for examples. Has your web designer gone AWOL? Do you have just a few changes that you need to make? We can help new clients with problems like this even if we didn't design their original website. We offer annual maintenance agreements to help you maintain your website by working with you to schedule and perform regular updates to your website's content. We also perform website design reviews and can make specific recommendations for enhancing the content of any website.